The North Campus Infrastructure Project at the British Columbia Institute of Technology (BCIT) in Burnaby, British Columbia is the recent recipient of the Envision Gold award for sustainable infrastructure. “The continuous community engagement throughout the North Campus Infrastructure Project has allowed BCIT to fully understand the needs of its community and to guide development and renewal opportunities that provide long-term benefits. This award further recognizes BCIT for its strong commitment and leadership in sustainability,” says Daniel Clement, BCIT director of Facilities Services. Funded by the Province of British Columbia, the Government of Canada Post-Secondary Institutions Strategic Investment Fund, and BCIT, the North Campus Infrastructure project provides a critical upgrade to the campus’ electrical infrastructure. Electrical power at the Burnaby Campus is currently provided through two on-campus high-voltage (HV) receiving stations called Goard Way and Canada Way, which are connected to the 12.5 kV HV service provided by BC Hydro. “Congratulations to BCIT on receiving the Envision Gold award for sustainable infrastructure. This is a great example of our government’s commitment to build modern learning spaces that benefit students, faculty, the community and the environment. These infrastructure upgrades boost innovation and long-term growth, creating good jobs for Canadians,” said the Honourable Navdeep Bains, Minister of Innovation, Science and Economic Development. CleanBC aims to reduce climate pollution and boost energy-efficient solutions, while creating more jobs and opportunities for people across the province. In 2015, BCIT had the condition of all its underground utilities for the Burnaby Campus assessed. The goal of the assessment was to help BCIT better understand the condition of each utility and plan maintenance and infrastructure investments accordingly. The condition assessment revealed that the Canada Way receiving station on the north side of campus and its associated electrical infrastructure was at critical risk of failure. As this critical infrastructure approaches or exceeds its useful life, replacement components have been difficult to come by, necessitating a system replacement. Any disruption to the electrical service at BCIT would have a significant impact on campus operations, such as the temporary closure of educational programming. As such, BCIT made the replacement of the Canada Way receiving station and associated electrical infrastructure one of its highest priorities. The primary objective of the $46.9 million North Campus Infrastructure Project is to improve the resiliency and reliability of the electrical infrastructure on the north side of the Burnaby Campus. The project includes constructing a new power receiving substation to replace the aging Canada Way receiving substation which powers about 50% of the campus, including all of the campus’ trades-based educational programs. The project also includes replacing 11 substations and all related infrastructure and establishing a new BC Hydro connection at the corner of Carey Ave and Canada Way. The new electrical backbone infrastructure on the north side of campus will encompass three major electrical services: high voltage (HV -12.5/25kV); low voltage (LV – below 750V); and a telecommunications, control, and safety service. The project also includes a number of enhancements and additions to public space. BCIT worked in close collaboration with Stantec, PCL Constructors Westcoast, R.F. Binnie & Associates, and PFS Studio to deliver this award-winning sustainable project. This project is unique in that it integrates a necessary infrastructure upgrade with stakeholder input acquired through the development of a larger Campus Plan. BCIT has been developing a Campus Plan since 2013 to guide development and renewal opportunities. To develop this Campus Plan, BCIT conducted a two-phase stakeholder engagement program to properly account for and capture the campus community’s needs, goals, and issues. Stakeholder input played a key role in the development of the North Campus Infrastructure Project. For example, stakeholders requested more bike routes; additional pedestrian-oriented spaces on campus; more covered outdoor spaces to sit, eat and socialize; and more parking specifically dedicated to car share vehicles. Such input has been accommodated in the re-design of English Street as part of this project. 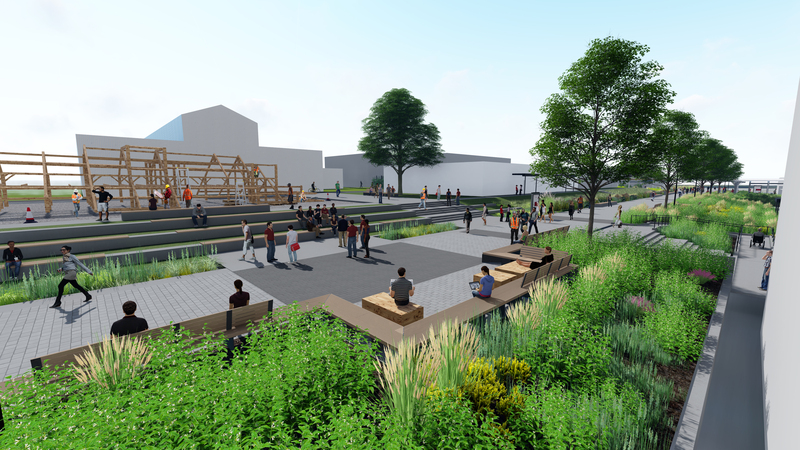 English Street—renamed English Walk—will become a pedestrian-friendly corridor connecting the east and west side of campus, and additional car share parking will be incorporated into the design as well. The project also includes the development of new cycling paths along Carey Avenue. The Burnaby area is expected to experience a number of changes brought on by climate change in the coming years, including warming temperatures; longer dry spells in the summer months; more precipitation in the fall, winter, and spring seasons; and more frequent and intense storm events. The BCIT North Campus Infrastructure Project is designed to be resilient to these anticipated changes. For example, more than 60 per cent of the project’s surface has a high solar reflectance index (SRI) value which will keep surfaces cool in the presence of solar radiation. The project’s landscaping will also serve to mitigate localized “heat islands” and contribute to a cooler campus microclimate during the expected increase in dry spells and increased ambient air temperatures. The electrical upgrades will complement and enhance the initiative for BCIT and BC Hydro to design and construct Canada’s first Smart Power Microgrid. Microgrids can function independently and collaboratively, helping to balance power generation with demand and reducing the potential for blackouts in extreme weather events. It will be able to integrate current energy sources such as hydro and natural gas, with alternative sources such as biomass, solar and wind. This supports the vision for BCIT to have more resilient and reliable energy infrastructure with the potential for the campus to operate off-grid in the future, in the event of an emergency or other power failure.